Retaine pm eye ointment. Nightime eye lubricant. 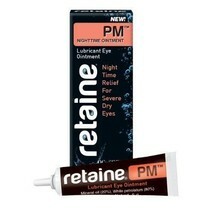 Keeps eyes lubricated and comfortable while you sleep. Moisturizes dry, scratchy, irritated eyes. Thicker consistency than most eydrops yet spread out evenly across the tear film. This minimizes frequent instillations and provides greater economy.